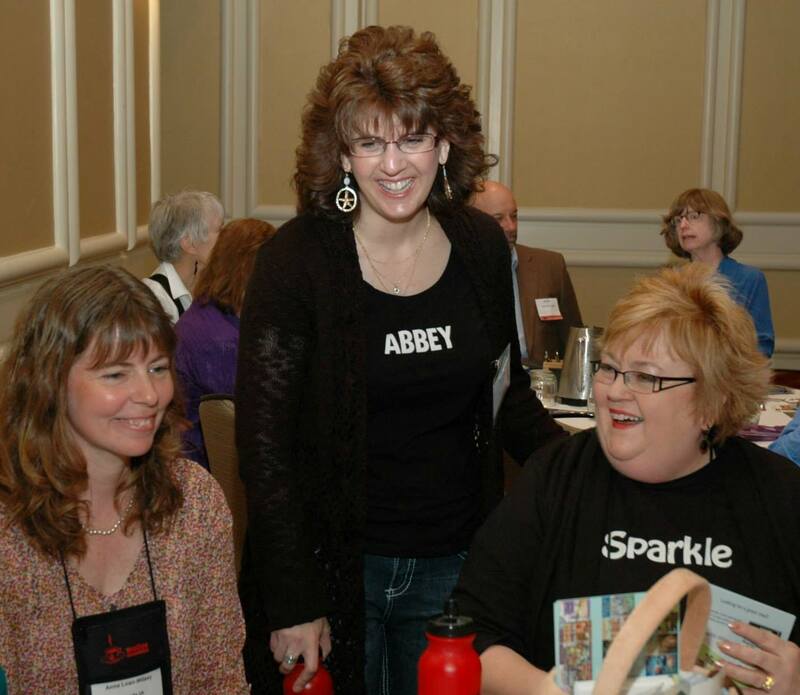 Apr, 01: Where in the world is Sparkle Abbey? Today we’re sharing a bit about our writing process as part of a special blog tour. We’ll answer the questions and then tag someone else. Sound like fun? THE GIRL WITH THE DACHSUND TATTOO is going through the editing process at our publisher, Bell Bridge Books, and will be released later this year. It’s a Mel book and we’ve had a lot of fun with it and learned a lot of fascinating information about Dachshunds. KITTY CONFIDENTIAL is in progress and we’re having a blast with it. Look for it to come out in 2015. Our cozy mysteries fall into the sub-genre of humorous mysteries, and into the sub-genre of mysteries with animals. In our books, the pets are sidekicks. They don’t solve the mysteries. However, the pet theme is more than a minor part of our books because our amateur sleuths, Caro and Melinda, work with pets. Caro is a pet therapist and Mel is a pet boutique owner. Pets are important to them and play a big role in the mystery plot. We have a unique twist in that the two protagonists, who are cousins, alternate as the lead character in the books. In other words, in the odd-numbered books Caro is the POV character, and in the even-numbered books Mel is the lead. The books share setting, secondary characters, and the cousins make appearances in each other’s books. Granted right now the two aren’t speaking to each other so they aren’t often on the same page. (Pun intended.) You see, there’s this little problem with a brooch that their Grandma Tillie left to her “favorite granddaughter.” Well, you can see the problem there, can’t you? 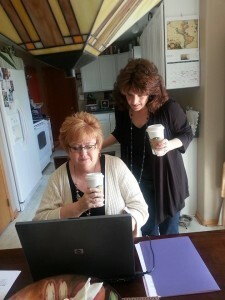 We’ve both love to write about family, relationships, and what makes people do what they do. What motivates them? How to they react under stress? What makes them tick? Oh, and we love puzzles and dead bodies. Our collaboration is also unique in that we write every other book. Mary Lee writes the Caro books and Anita writes the Mel books. Because of this our writing process is a bit different than it would be if we worked alone or if we had a more traditional co-writing arrangement. We’re both plotters but we’re hybrid plotters. Never heard that term before? It may be that we just made it up. What it means to us is that we plot out the story in advance. (This is very important for us because the books stand alone, but the series must be tightly woven together.) However, while we plot the story before we begin writing, we’re both very character-driven writers so if what we’ve planned doesn’t work once we’re in the midst of writing the story, we may make some changes. That’s what we mean by hybrid plotters. The first step after planning out the storyline is a rough draft. We both find our first drafts are mostly dialogue. (What’s more interesting than people talking, right?) Then we go back in and add additional details, make sure the plot-points line-up, and tweak the things that need tweaking. Finally, once more through to look for any problems and then the story is off to our publisher. Aug, 19: Where has summer gone? Can you believe summer is almost over? We hope you’ve made some great memories over the past couple of months! Here’s a glimpse of what we have planned for September so far. Maybe we’ll see you there. The 11th we’re headed to the Clinton Public Library to speak to their Killer Reads Book Club. They’ve chosen Desperate Housedogs as their book of the month. The 13th, we’re on to Chicago to attend the Mystery Writers of America University with guest speaker Sara Paretsky. The 20th we’re also presenting a workshop at the All-Iowa Writers Conference in Montezuma, Iowa. 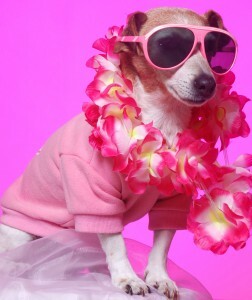 And then, of course, we’re working on books 7 & 8 in the Pampered Pets Mystery series! 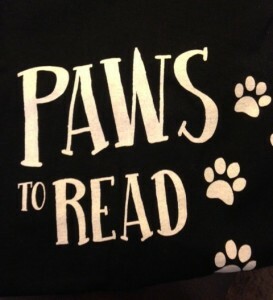 If you’d like for us to visit with your book club or local library, send us an email! 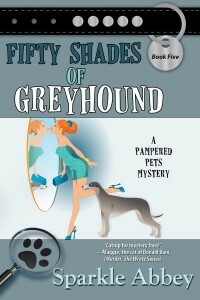 Jul, 08: Fifty Shades of Greyhound – Amazon Monthly 100 Deal! Our big news is that for the whole month of July our newest book, Fifty Shades of Greyhound is an Amazon Monthly 100 Deal for $1.99! How fun is that? And we’ve already received some wonderful celebrity endorsements! A virtual tour that is! We are spreading the news about our latest book, Fifty Shades of Greyhound, by hitting the road on a virtual tour through Great Escapes Book Tours . There will be prizes at many of the stops and also a Rafflecopter drawing for a $50 Amazon gift certificate. Check out the schedule below and join us as we visit some great blogs. 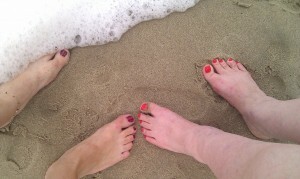 We’re just back from Malice Domestic, the annual conference for traditional mysteries. We had such a wonderful time seeing old friends and meeting new ones. We participated in Malice-Go-Round which is sort of like speed dating for authors. 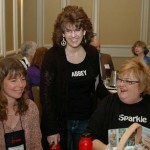 Authors travel from table to table and share a bit about what they write and also their latest book. 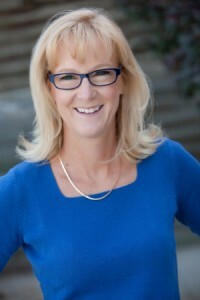 We got to partner with fellow Iowa author, Anna Loan-Wilsey who writes the Hattie Davish historical mystery series. Also, we attended the Sisters in Crime breakfast. The mission of this group is to promote the ongoing advancement, recognition and professional development of women crime writers. It’s open to both writers and readers of crime fiction. The conference always supports John L. Gildner Regional Institute for Children and Adolescents and we contributed an auction item, a basket full of Sparkle Abbey books and pampered pet items. 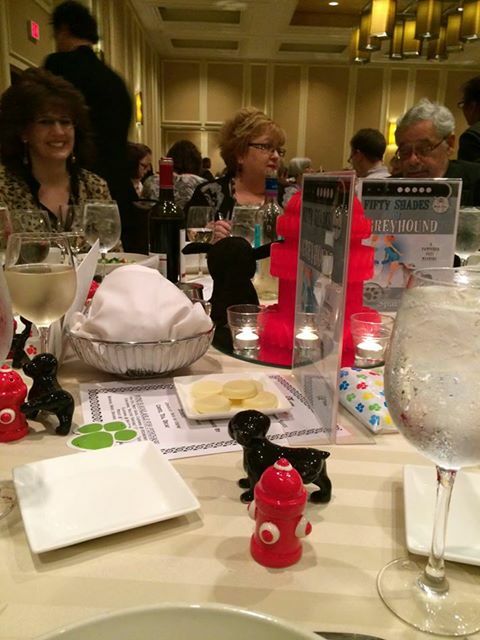 The Agatha Awards banquet is on Saturday and we were asked to host an author table. 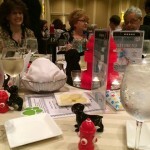 We had fun coming up with table decorations and giveaways for attendees who chose our table. Then on Sunday we were part of a panel, “Tales with Tails” along with Jayne Ormerod , Laura Morrigan, Jessie Chandler, Waverly Fitzgerald and Pepe, the Chihuahua. What a great group! And finally before we headed to the airport, we attended the Closing Tea – A Toast to Earlene Fowler. Thanks for the memories, Malice Domestic 26. We can’t wait for Malice 27 in 2015! We’ll answer the questions posed to tour participants below, then hand the torch off to the next author for their part of the tour. Sound like fun? We’ve both been writing for a long time and for both of us all of the stories, while they’ve had different themes, are mostly about what makes people do what they do. What motivates them? How to they react under stress? What makes them tick? So, we’d have to say we write what we write because people are endlessly fascinating. First, our cozy mysteries would fall into the sub-genre of humorous mysteries, and also into the sub-genre of mysteries with animals. As Linda mentioned in her post, pets have long been a common and beloved theme in cozies. In our books, the pets are sidekicks. They don’t solve the mysteries. However, the pet theme is more than a minor part of our books because our amateur sleuths, Caro and Melinda, work with pets. Caro is a pet therapist and Mel is a pet boutique owner. Pets are important to them and play a big role in the mystery plot. Secondly, we have a unique twist in that the two protagonists, who are cousins, alternate as the lead character in the books in our series. In other words, in the odd-numbered books Caro is the POV character, and in the even-numbered books Mel is the lead. The books share setting, secondary characters, and the cousins make appearances in each other’s books. Granted right now the two aren’t speaking to each other so they aren’t often on the same page. (Pun intended.) You see, there’s this little problem with a brooch that their Grandma Tillie left to her “favorite granddaughter.” Well, you can see the problem there, can’t you? We’re both plotters but we’re hybrid plotters. Never heard that term before? It may be that we just made it up. 😀 What it means to us is that we plot out the story in advance. (This is very important for us because the books stand alone, but the series must be tightly woven together.) However, while we plot the story before we begin writing, we’re both very character-driven writers so if what we’ve planned doesn’t work once we’re in the midst of writing the story, we may make some changes. That’s what we mean by hybrid plotters. FIFTY SHADES OF GREYHOUND is going through the final processes at our publisher, Bell Bridge Books, and will be released later this month. It’s a Caro book and we’ve had a lot of fun with it and learned a lot of fascinating information about Greyhounds. THE GIRL WITH THE DACHSUND TATTOO is in progress and we’re having a blast with it. Look for it to come out later in 2014. Please meet the wonderful Shannon Baker, who writes a great series and who we met at our very first mystery conference, Mayhem in the Midlands in Omaha, NE. Shannon Baker, author of the Nora Abbott Mystery series involving murder, environment and Hopi Indians, can often be found backpacking, skiing, kayaking, cycling, or just playing lizard in the desert. From the Colorado Rockies to the Nebraska Sandhills, the peaks of Flagstaff and the deserts of Tucson, landscapes play an important role in her books. Tainted Mountain, the first in her Nora Abbott Mystery Series, is set in Flagstaff, AZ, where she lived for several years and worked for The Grand Canyon Trust, a hotbed of environmentalists who, usually, don’t resort to murder. She lived twenty years in the Nebraska Sandhills, where cattle outnumber people by more than 50:1. When Shannon moved to Boulder, CO, Nora followed her and Broken Trust is set in the gorgeous Rocky Mountains. Shannon now makes her temporary home in Nebraska and believes her job description is now itinerate writer. What fun we’ve had with this short story idea! Our story in the collection is PROJECT DOGWAY. It’s high fashion hijinks in Laguna Beach with designer togs, spa pampering, and jewels galore…and that’s just the dogs. With canines on the catwalk at this fundraising haute dog fashion show, pet therapist, Caro, and cousin Mel, owner of the local Bow Wow Boutique, are mingling with the crowd, but still not speaking to each other. 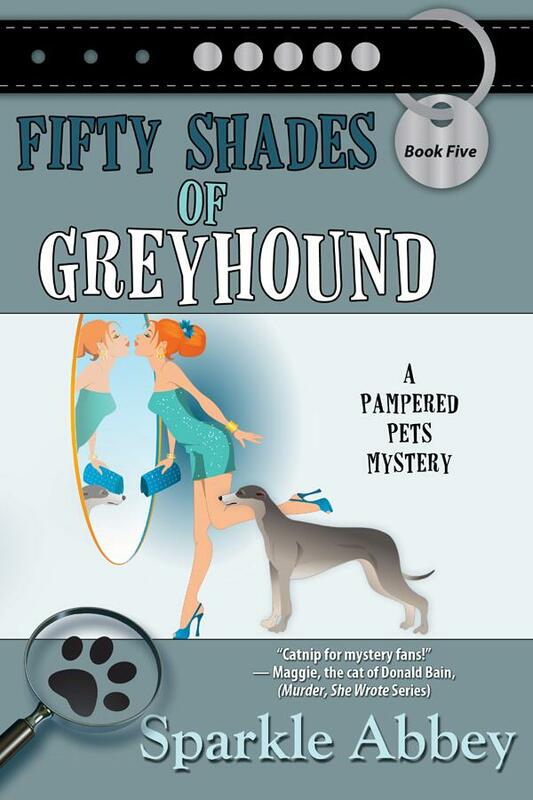 But when one of Caro’s clients, Phil Tawny, the protective owner of Shadow, an award-winning beagle, drops dead at the event, the feuding cousins find themselves embroiled in much more than a fashion “faux paw.” There’s a rabid Shadow fan, a fame-hungry ex-wife, and a detective who doesn’t want them sniffing around his investigation. But Caro and Mel refuse to sit/stay, and soon find themselves on the tail of a killer. And we’re launching the collection on February 24 with a Facebook Launch Party. Each author will host a half-hour time slot (ours is 8:30-9:00 p.m. Eastern, which is 7:30 Central, & 5:30 Pacific) and during that half-hour the author will give away a cool prize! We think you’ll like what we have planned. In addition, at the end of the evening there will be a grand-prize drawing for a $100 Amazon gift card! Sound like fun? Please join us for the festivities here – Here We Go Again Launch Party! Dec, 31: Coming soon: A Short Story! Though still not speaking to each other, former Texas beauty queen cousins, Caro Lamont and Melinda Langston are at it again – attempting to solve murders that is. This time they’re both in attendance at a Laguna Beach dog fashion show- a heartworm fundraiser, when show beagle owner, Phil Tawney, drops dead and his dog, Shadow, goes missing. Pet therapist, Caro, is on the lookout for the missing pup, and Bow Wow Boutique owner, Mel, is sniffing out the truth behind the rumored reality show, Behind the Curtain of Best in Show. While the cousins are doing their best to stay out of Detective Judd Malone’s investigation, it’s really no surprise they soon find themselves on the tail of the killer. Was it the fame hungry soon-to-be ex-wife, the rabid Shadow fan, or the aspiring actor who served the deadly appetizer? Or did someone else have a hidden agenda? And can Caro and Mel chase down the clues before someone gets away with murder? 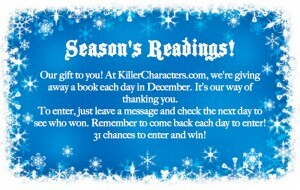 We’ve joined the crew at the Killer Characters blog, and we are giving away a book a day for the month of December. It’s our way of saying thank-you to our readers. 31 days – 31 books – 31 chances to win! 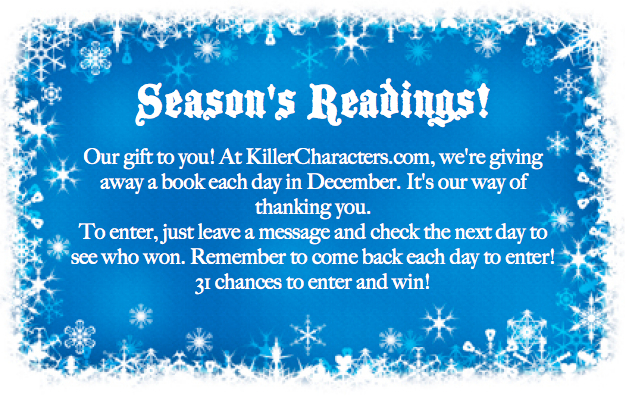 To enter simply leave a comment on the Killer Characters blog. There will be a new drawing every day, so keep coming back and leaving comments to be included in the daily drawings. Happy Holidays to all of you from us and all the other Killer Characters!